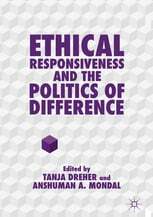 This edited collection focuses on the ethics, politics and practices of responsiveness in the context of racism, inequality, difference and controversy. The politics of difference has long been concerned with speech, voice and representation. By focusing on the practices and politics of responsiveness—listening, reading and witnessing—the volume identifies vital new possibilities for ethics and social justice. Chapters focus on the conditions of possibility, or listening as ethical praxis; unsettling or disrupting colonial relationships; and ways of listening that highlight non-Western traditions and move beyond the liberal frame. Ethical responsiveness shifts some of the responsibility for negotiating difference and more just futures from subordinated speakers, and on to the relatively more privileged and powerful. Dr.Tanja Dreher is Associate Professor in Media at the University of New South Wales in Sydney, Australia. She is co-chair of IAMCR's Community Communication and Alternative Media Section.